The world premiere ballet, The Little Mermaid, is inspired by H.C Andersen’s fairy tale including details from his biography. The Little Mermaid combines classical ballet with contemporary dance. 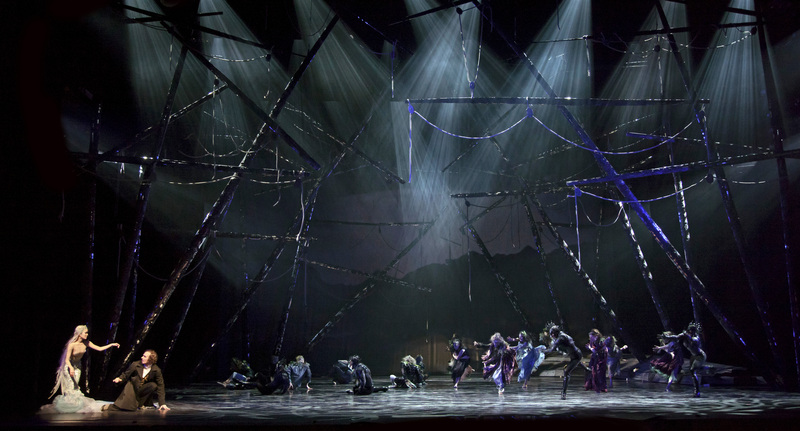 Visually it bridges classical ballet scenography with modern technology exploring the future of ballet design. For example, the underwater world is brought to life with cutting-edge 3D projections. The visual dramaturgy is integral to this unprecedented ballet due to the cohesive collaboration of the creative team from conception to realisation. The scenography is comprised of twelve different set designs and the concept of each scene has been enriched with lighting and the use of projections incorporated into the scenography. The production has run for three sold out seasons and has received critical acclaim. takis is an international performance designer based in London, whose innovative and diverse body of work encompasses West End productions, and leading UK theatres, Major International Musicals, Opera, Ballet and Circus productions. takis studied Costume and Set Design at the Romanian National University of Arts in Bucharest and continued his studies at the Royal Academy of Dramatic Art on the Theatre Technical Arts Course. He undertook practice based research at London College of Fashion, researching new methodologies of design in Fashion and Performance and he is currently completing his Doctoral research at Aalto University, Finland. He has worked for Companies including: Finnish National Opera, Frankfurt Opera House, English Touring Opera, Opera Holland Park, London National Theatre, Old Vic, Queen Elisabeth Hall, Barbican, Curve, West Yorkshire Playhouse, Theatre Royal Brighton, Royal & Derngate, Theatre Royal Stratford East, The Hong Kong Academy of Performing Arts, Haugesund Theater (Norway), Ancient Theatre of Epidaurus, Rambert Dance Company, as well as the Bush, Soho, Mercury, Sherman & Citizens Theatres amongst others. takis' work has been exhibited at the Design Museums in London and Helsinki and the Bucharest Modern Art Museum.